Improved accuracy and repeatability from the punch-shear combination machine has led to savings in downstream processes such as in press-brake forming, where dimensional accuracy from SGe enables faster setup times, and in welding due to improved part fitup. In 1954, Joe LaForce purchased a modest hardware-supply business in downtown Green Bay, WI. Today, his company, LaForce, Inc. has evolved into one of the largest U.S. distributors of commercial doors, frames, and hardware and building specialties. Its products can be found in a variety of office buildings, healthcare facilities, hospitals, nursing homes, clinics, schools, retail outlets and sports stadiums. In addition to its Green Bay headquarters, LaForce operates 11 other U.S. locations, where it performs custom manufacturing of doors and frames, and offers product installation, pre-installation, pre-finishing, security integration, specification writing, fire-door inspections and key system services. Its 12 locations employ approximately 500 people. In its early years, the company operated mostly as a distributor. By 1969, LaForce realized that he needed to bring door and frame production inhouse, in order to sell with consistent quality and make timely deliveries. 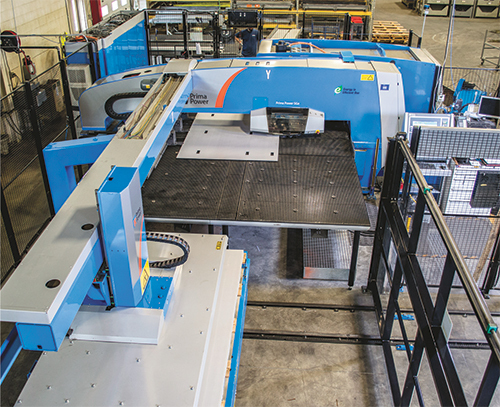 Toward that end, the company purchased two turret punch presses, two hydraulic shears and several press brakes to fabricate and bend its products. Tool-holder flexibility—Individual tool holders allow fabricators to design their own turret layouts, rather than having tool stations machined into the turret. Auto Index—The punch and die rotate in their tool holders, in 0.001-deg. programmable increments, and they can rotate beyond 360 deg., providing the shortest path to a programmed angle. Upward Forming—An upforming option provides accurate forming to 16 mm. And, all dies are at the same height, with minimal risk of material damage and increased machine uptime. Fast forward to 2013, and LaForce began a search for a more efficient and productive way to fabricate its products at the 310,000-sq.-ft. headquarters facility. After much research, LaForce accomplished just that with the acquisition of a servo-electric punch-shear combination machine (a Prima Power Shear Genius SGe, acquired late in 2013). With the punch-shear concept, the objective is to provide a machine capable of transforming a full-size sheet into finished parts. Parts then can be moved to final production stages for immediate integration into final product assembly. The heart of LaForce’s Shear Genius SGe is a servo-electric 30-metric-ton punching machine with a maximum stroke speed of 1000 hits/min; an index speed to 250 rpm; and a maximum sheet-position speed of 150 m/min. The machine’s right-angle shear boasts a servo-electric actuation system that makes shear movement quick and fully CNC-controlled. It can shear aluminum sheet to 5 mm thick, mild steel to 4 mm and stainless steel to 3 mm. The machine features automated sheet loading, as well as programmable and automated part removal and sorting. And, according to Johnson, all of that automation enables minimal setup times and lights-out unmanned operations, resulting in finished parts with a dramatic reduction in scrap and manual labor. The heart of LaForce’s Shear Genius SGe is a servo-electric 30-metric-ton punching machine with a maximum stroke speed of 1000 hits/min; an index speed to 250 rpm; and a maximum sheet-position speed of 150 m/min. The machine’s right-angle shear boasts a servo-electric actuation system that makes shear movement quick and fully CNC-controlled. LaForce also finds that the punch-shear machine eliminates wasteful skeletons and costly secondary operations such as deburring, thanks to shearing of part edges rather than nibbling. During machine operation, a sheet is loaded and squared automatically without human interference. And, the same clamps that grip the sheet for punching also hold it for shearing. On average, compared with a stand-alone turret punch press, the SGe reduces total manufacturing time by 60 percent. “The SGe does exactly what we thought it would do,” says Johnson. 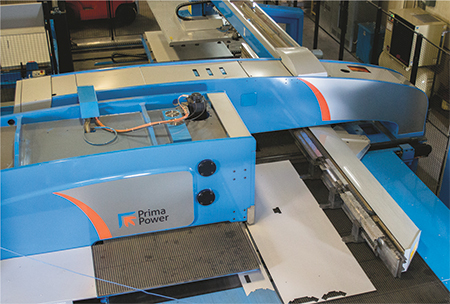 “We vetted this machine closely and conducted a lot of research prior to purchasing it. We initially were looking for a laser-cutting machine, and plenty of people tried to convince us that a fiber-laser was the way to go.